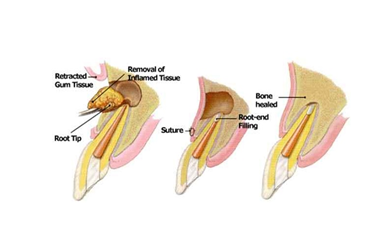 An apicoectomy is a simple surgical procedure for the tooth apex to stop and prevent recurrent apical infection associated with root canal treated tooth. When an infection will not go away or returns after a root canal has been performed, this procedure is usually necessary. During this procedure the tip of the root of the tooth is removed and the Root Canal tip will be filled with a special filling. In most cases, a re-treatment of the root canal is considered before an apicectomy since it is a simpler, less invasive procedure. 1. Local anesthetic to numb the area. 2. Dr Yousif will start by making an incision in your gum to expose the root of your tooth. 3. Any inflamed tissue will be removed to clean out the area. The surgery takes place in a very small area, and only a few millimetres are removed from the root. 4. After the root is removed a filling is placed and the gums are sutured. Depending on the type of sutures you may have to return in a few days to have them removed, or dissolving sutures may be used instead. Over the course of the next few months the bone will heal around the root.